1 Blow ye the trumpet in Zion, and sound an alarm in my holy mountain: let all the inhabitants of the land tremble: for the day of the Lord cometh, for it is nigh at hand. I believe the Church (the called out ones, the bride, the remnant, those who have garments white as snow) have now entered into their GREATEST Hour. Born for a time such as this, they will go forth in His name conquering, and doing mighty exploits. They will now realise just why the training, testing and trials have been so tough and so long. I saw 2 quick visions this afternoon. A beautiful white fishing net being cast. The fields are now white unto harvest, we must cast the nets and bring in the lost. Lord let us bring LIGHT and HOPE into this darkness. And secondly I saw David with his slingshot slaying the giant, and sense the Lord wants us to slay the giants with the power of His WORD in our mouths. Fear and GREAT fear is coming upon the USA. Lord Jesus, let your chosen ones, your mighty army arise. Amen. A huge AMEN, Mikey! As soon as I read that phrase you mentioned, I felt a quickening in my spirit. I’ve spent the last 7 years in the “wilderness” being transformed by the power of the Holy Spirit. I now know why. I was born for such a time as this! Blessings to you and yours. “See, The Lord Emerges From His Place to punish those on Earth for Their Sins. and no longer conceal its slain”. The President should declare 3 days of Repentance, The severity of the next judgement wouldn’t be that catastrophe. We Need President Trump To declare 3 days of Repentance. Let us Repent, let us all return back to the Lord. America The Land that has once been the leader in spreading Christianity, has now become the nation that is eroding it. Let’s us Repent, let Us Repent, Before it is too late. we should used block of our prayers for our selves and our families. We are under siege from the devil itself. For His Name to be more effective We Must Repent first. Weaponized technology….. Steve Quayle.com has an article about this and other storms being manipulated. I have heard from other researchers speaking about this, HAARP being one example. Actually I remember my Philippine supervisor in the Q.A. department telling me how he was part of a crew helping manipulate the weather so that those in charge at the time could have clear weather for a state parade, I believe being held in Manila. The part of the prophetic word about people who aren’t all human I believe is true based on others I’ve heard. This all rings true, especially the command for repentance and intercession. Thank you for sharing. God bless! Thank you my dear Sister for sharing this important message. This part caught my attention especially: “Intercessors, pray fervently as many will suffer, many will die in need of a Savior. Pray for these as often and continually as you are able.” Is this the same call to prayer as in Rev 8:1-5? If it is, Think of the implications. . .
Hopefully people see what Osteen and his church has done (barely nothing) to help the displaced. He won’t even open his stadium to the displaced. He was dragged hard last night on social media. Lied about the condition of the church i.e. flooding and roads being inaccessible. People took to the streets with their phones and proved the church wasn’t flooded and the roads are very accessible. Latest update is that they are preparing and gathering supplies to open the church up. I pray this is true. Lots of shelters are way passed capacity. Please use me for Your glory. Wow Peggy, every single warning of judgment beginning is exactly the same lately. I believe we are heading into a very trying time. WE ALL need to abide in God and his word and hold on tight! I think things are going to get rough! It’s not over for Houston. There is a weak low scheduled to develop in Yucatan part of the Gulf in a few days, and head right for them. Also, Invest 93L, will more than likely be Irma in the next two days, if the storm of Carolina develops first then 93L will be named Jose. This storm is predicted to head across the Atlantic, and then get into the Caribbean and Gulf Of Mexico. Irma/Jose could take the same path as Harvey. 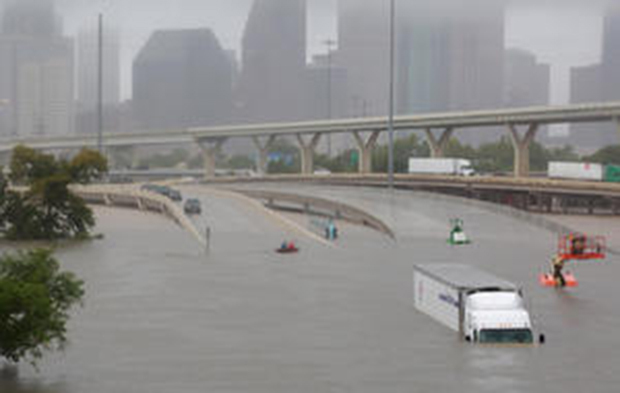 I starting to think it will be multiple tropical systems that will cause major flood damages in Houston this year, destroying this city by flood. Next crisis, ie North Korea has become hot again with the latest missile launch over Japan.